The hand carving of natural stone into almost limitless shapes and details is one of the world’s most ancient crafts as can be seen today where civilisations existed thousands of years ago. The basic tool of the carver has changed very little over the centuries, but with the advantage of modern machine tools much of the labour intensive preparatory work can be accomplished more quickly and efficiently. Hi-tec computerised profiling machines can be programmed to produce faithful basic details of, for instance, huge Corinthian capitals. Thankfully, machines cannot perform all of the tasks that a highly skilled carver has to undertake; neither do machines have the feeling for the stone and the range of expression that carvers instinctively possess. 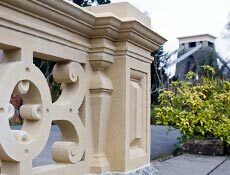 Each mason has his or her own interpretation when pieces are being transformed from plain blocks of stone to artefacts of considerable beauty. As far as it is possible to be certain of anything it can be presumed that the skills of the stone carver will be in demand for as long as mankind is on the face of the Earth.